In this document the stereo search options are summarized and their usage is shown in different search interfaces. Sets whether a chiral flag should be ignored or not. Default value is true for both options. A: always absolute stereo (true). Java Server PagesOption can be set on Query>advanced options tab by adding Additional Cartridge-style search option: absoluteStereo:t/c/a. No check: No double bond cis/trans is considered. Marked: (Default) Double bond cis/trans stereo is checked for double bonds designated by the stereo search flag only. However, for queries coming from the Daylight formats family, all double bonds are considered which have specified stereo configuration. See the matching differences between different formats. All: All double bonds are checked for cis/trans stereo matching. 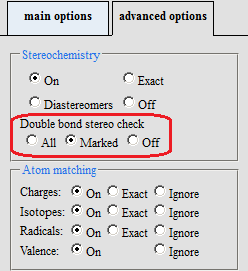 Option can be set on Query>advanced options tab by selecting Double bond stereo check: "All", "Marked", and "Off" in the Stereochemisty panel. Default value is "Marked". Sets ignoring cumulene or ring cis-trans stereo information during serching. Sets ignoring axial stereo information during searching. Sets ignoring double bond stereo information during searching. If this option is set (true) double bond stereo information is ignored and setStereoSearchType(int) only specifies tetrahedral stereo matching. Sets ignoring syn-anti stereo information during searching. Default value is true. .
Sets ignoring tetrahedral stereo information during searching. If this option is set (true) tetrahedral stereo information is ignored and setStereoSearchType(int) only specifies double bond stereo matching. Stereospecific (default in case of search types other than duplicate): When the query does not contain stereo information, the hits will include results both with and without stereo information. Otherwise, the stereo information is taken into account during the search. Ignore stereo: All stereo information is ignored. Exact stereo (default in case of duplicate search): All stereo information is tested for equality, meaning that a non-stereo query only matches non-stereo targets and enhanced stereo groups can't match on absolute stereo atoms. Diastereomer stereo : Retrieves stereoisomers where tetrahedral stereo information is present on the same stereo centers, but their configuration (parity) is arbitrary. Enantiomer stereo: Retrieves the given query stereo configuration and its enantiomer as well. 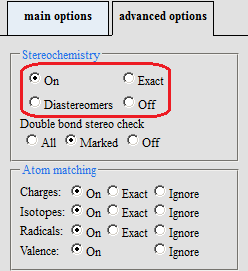 Option can be set on Query>advanced options tab by selecting "On", "Exact", "Diastereomers", or "Off" in the Stereochemisty panel. Default value is "On". Local: Default for markush search in all cases and for non-markush duplicate search in query tables. Global: Default for non-markush duplicate search (with the exception of query tables). Default value is SearchConstants.STEREO_MODEL_DEFAULT, whose actual behavior depends on the search type. For substructure and superstructure searches, it equals to SearchConstants.STEREO_MODEL_COMPREHENSIVE, while for other searches, it usually equals to SearchConstants.STEREO_MODEL_GLOBAL. Default value is SearchConstants.STEREO_MODEL_DEFAULT, whose actual behavior depends on the search type and the type of the structure table. For substructure and superstructure searches, it equals to SearchConstants.STEREO_MODEL_COMPREHENSIVE, while for other searches, it usually equals to SearchConstants.STEREO_MODEL_GLOBAL.